As I write this, a soft snoring emanates from a dog kennel behind me. Lily’s asleep, finally. Two weeks ago last Sunday, I picked Lily up from the Lawrence Humane Society. She’s a 7-month-old puggle, a pug/beagle mix. She’s adorable and she’s ornery as hell. 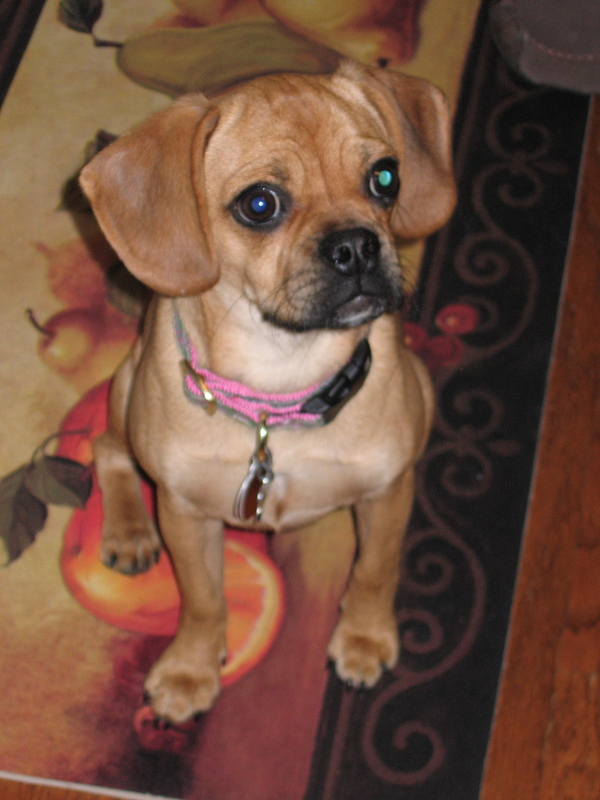 When I researched the puggle hybrid, I found that they tend to have the beagle’s energy and love of tracking combined with a pug’s sweetness and obstinance. If Lily (or “Lily Pad,” as I call her, because her security toy is a stuffed frog) is anything, it’s obstinate. In another week or so, Lily and I will be heading to puppy training class at Petsmart. Lily’s made great progress so far. She can sit and shake, is finally recognizing her name and is juuust about housetrained. We definitely need to work on some obedience and chewing issues. Lily. Looking far more innocent than she actually is. Compared with some horror stories I’ve read about puggles, Lily’s a breeze. However, she does have her little idiosyncracies. She loves chewing on the rocks from my mother’s tree pot in the living room. Lily might be sleeping in her bed at one moment and chewing through it in the next. The biggest mystery of her behavior is, bar none, her FRAPs. What’s a FRAP? I had no idea until I researched it after Lily had already had several. Basically, a FRAP is a Frenetic Random Activity Period. In layman’s term, the puppy (and it’s almost always almost-adult puppies) goes bat guano insane for a few minutes, running furiously throughout the house, jumping on furniture and generally expelling energy. Now that the weather is getting nicer, we can take Lily outside more and for more walks. I’m hoping her class helps her (read: me) with some of her behavioral issues. I’ve thought, “What the heck was I thinking?” several times since we’ve gotten her. It’s usually after she’s had a FRAP or when I’ve had to take her outside to do her lady business at like 4 a.m. Then she cuddles up to me on the couch or does something cute and I forget all about it. Sadly, I think she’s probably MY alpha. This Saturday, I’ll be taking home my new puppy. After submitting a general adoption application to the Lawrence Humane Society and visiting the shelter last weekend, we picked out a 6-month-old puggle (pug/beagle mix) female. We’re ditching her shelter name and calling her Lily. We’re making a trip to Petsmart to pick out her crate, toys, food, water dish, an ID tag, collar and other incidentals. My mother and I are spending Saturday, Sunday and Monday training her and getting her used to the house and the crate. I’m glad I did research before getting her home. I want to give Lily plenty of structure and discipline, and we’re going to try to simulate pack behavior. She needs to learn how to walk properly (beside or behind us, never in front), when to eat (only when we give her food), where to potty (only in the yard), when to enter the house or a room (only after we do) and when she can get on our laps or the couch (only when we give her permission). The hardest part will be treating her like a dog, not a human. My father’s kind of under the impression that this is draconian and will lead to an unhappy puppy, but I’m trying to convince him that a happy puppy is a calm puppy and one who knows her place in the “pack” (our family). I’m more worried about him slipping (sneaking her “people” food, letting her on his lap without permission) than I’m worried about her misbehaving. I’m also trying to convince him that a yipping, hopping, excited dog is an anxious and insecure dog, and that the “excitement” doesn’t mean the same thing it does in the human sense. I told him that Lily should signal happiness by acting calm, submissive and quiet, and he made some quip about her being “a stick in the mud.” Oh he’ll learn. A lot of this will be down to trial and error, and I’m sure my patience will be tested. I’m just excited to get my sweet little girl home and have her get adapted to her new home.